Ask Amanda: How do I count my rows? Counting rows in knitting can be a tricky business. I had a lot of trouble learning to do it accurately – I’d routinely count the number of rows over and over, ending up with different numbers every time! 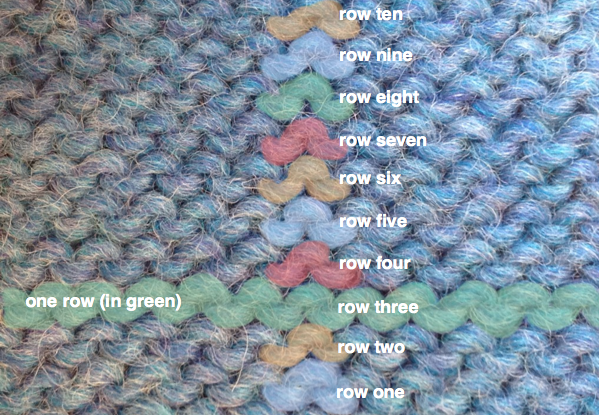 Learning to count rows will make any knitting project easier (Hami, the tank top pictured, is a perfect example). If the yarn is especially fuzzy, I’ll stretch it out a little with my fingers to get a better look – each row starts to separate from its neighbors, making counting easier. Of course, you wouldn’t want to stretch the fabric like this if you’re trying to count a row gauge, since you wouldn’t get an accurate number! Below, you can see how the rows begin to separate, leaving recessed areas between them. Even after you’ve learned to “read” your knitting and have mastered all the knitting basics, it can still be confusing when it comes time to count your rows, especially if you’re doing an unfamiliar or elaborate pattern stitch. If you start working on something a little more complicated, it’s probably a good idea to keep track of your rows on paper or with a row counter. The stitch pattern below, from Norah’s cardigan design Apropos, is a good example of the kind of project that would benefit from more concrete tracking, as the stitch’s unusual construction and wide open lace areas make it pretty hard to identify each individual row. Though you may struggle or get frustrated, keep in mind that with some practice, you’ll be able to quickly identify the rows on your knitting projects, and begin to learn when additional tools will come in handy. I’ve always wondered: do you count the loop on your needle as a row? 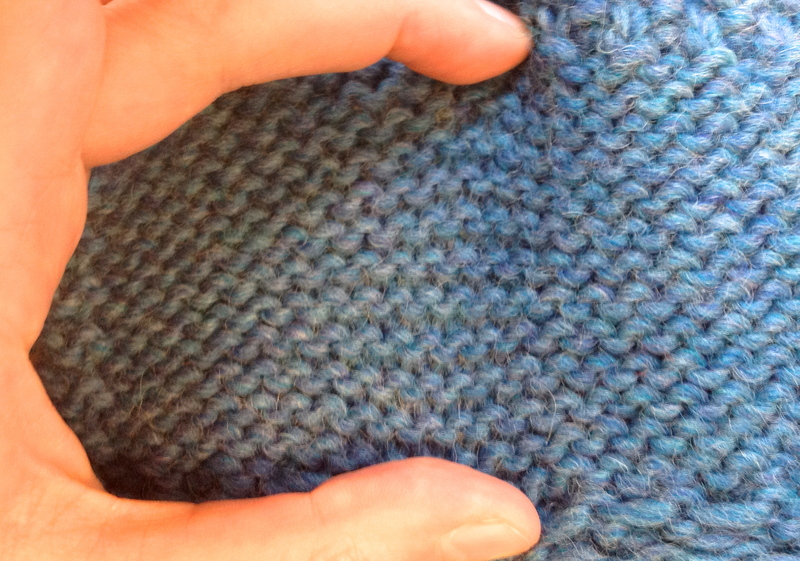 And…when counting stockinette starting from a CO or garter edging, what does that first V look like? To me it looks like half a V and I never know if I should count it. Very good questions! It’s a little bit confusing, but the loops on your needle aren’t a completed row, they’re more of a “future row” – they will form the next row when you knit them. So, when you’re counting, only count completed rows, and not the loops on the needle. When counting stockinette starting from a CO or garter, the first row of Vs does sometimes look a little short and weird. If I’m having trouble identifying where the Vs start from the RS, I’ll flip it over and look the WS instead. The first row of purl bumps after the CO or garter edging will be the reverse side of the first row of Vs, and you can start counting with that row. Well done visuals, Amanda. Thank you! Lately I’m finding that inserting locking stich markers every ten rows helps me track.But every project is different. Thanks, Kate! Great point about each project being different – a trick that works great for one type of project might not work as well for something else. Experimentation is key! What does CO stand for? I am a Absolute beginner! Knitting in a “vertical lifeline” (in a contrasting colour of cotton yarn or thread) will help the stitches to stand out and you will see them more clearly. As for lace patterns, counting the selvedge stitches should do the trick. What do you think? This helped me a lot, thank you Amanda! We’re so glad it helped! I hope you can help me. im knitting a boxed poncho for my daughter for her b-day. I cast on 130 stitches on circular needles. im about 10 inches away from finishing one half and have noticed that I only have 129 stitches on my needles. ive tore out 10 rows so far and still at 129 stitches. last time I counted there was 130 stitches. my question is should I continue looking to see where the mistake is or just finish it. I have it lying flat out and haven’t noticed any holes in my work. so it has to be at either the begging of the row or the end. any suggestion would be much appreciated. Please contact patternsupport@berroco.com with specific questions. does it mean: 3 times knit and 3 times purl, 6 rows altogether? You pattern is asking you to knit a total of 6 rows. So you literally will knit 1 row then purl 1 row three times. So each “knit” and each “purl” make separate rows, am I right? Yes. 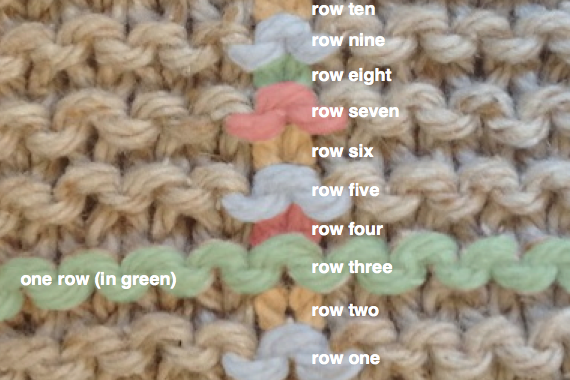 When you knit a row, that makes 1 row. When you purl a row that makes a second row. This has been helpful! Thank you! I’m trying to teach myself how to knit and it is very slow going. But this post was very helpful. I’ll pull out my knittting again today and have another go at it. Thanks again! Thank you for your good explanation of how to count rows. I would like to know why you seemingly have columns on the right side of your “V”? I recently did a swatch of stockinette to check my gauge and had the same outcome as you. I have never had this happen before now. The yarn is a Worsted Merino Superwash. 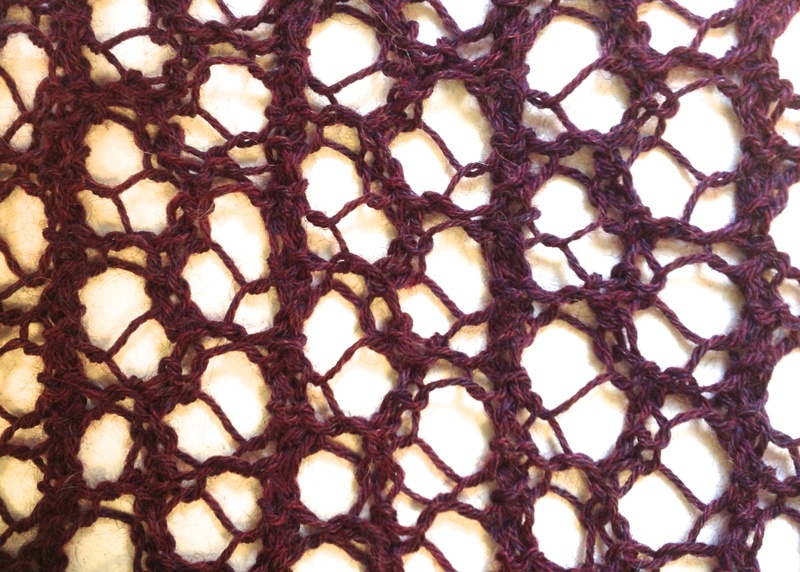 What causes this “line” in my knitting – and mine were more pronounced? It’s ofen to do with a slightly different tension on your purl rows. It is indeed more pronounced with certain knitters and yarns. Thank you !!! This is very useful …Yours pics made it crystal clear for me ! I am somewhat confused about an instruction of a pattern that reads the following: Row 1-4: K3, * k6, p6, repeat from * to last 3 sts.k3. Here is my question; Do I knit 3, then knit another k6? Appreciate for your repsonse. Thank you. Yep! Pretend that asterisk is like a parenthesis. K3, *(k6, p6) repeat from * to last 3 stitches, k3. So you repeat the k6, p6 section until you have three stitches left. Hope this helps! Thanks a bunches! Now, more than eager and determined to get this project done **__**! 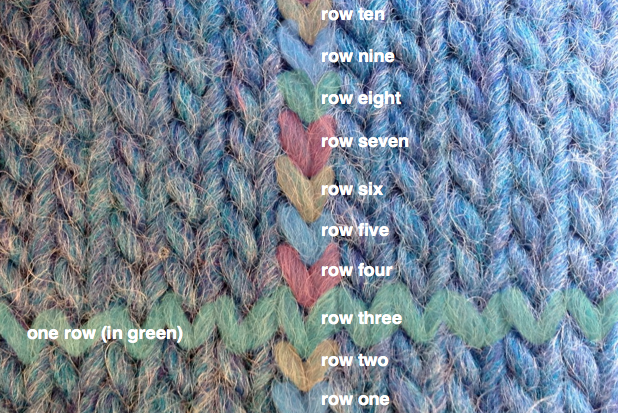 Thank you for your explanation of “stockinette rows”…. I get it, now. Although if they ever start over in this tradition, I hope they use a different nomenclature!!! Welcome refreshing and learning new techniques! Thank you! What is the pattern for the shell, please? Thank you. Great article, thank you! Also where can I find the pattern for the top in the photo? It’s pretty. Glad you found this helpful! And good news, we have a video about mattress stitch that will likely help you with the sewing!